Dozens of workers at RadNet, the nation’s largest imaging center, rejected a fierce anti-union campaign from management and voted this month to join NUHW. 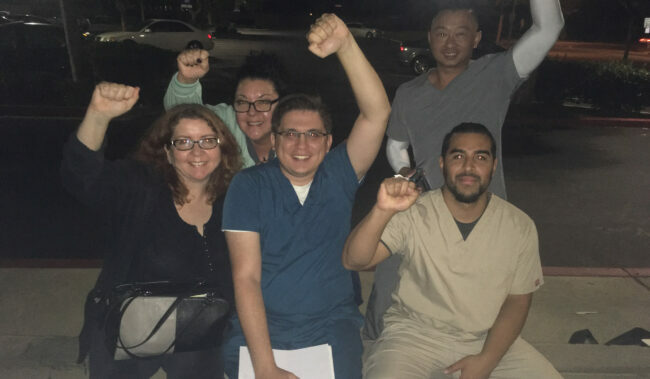 In a series of elections, 67 RadNet employees at seven sites across Orange County choose to form a union to fight for better pay, less oppressive workloads and respect from their bosses. They join their colleagues at two Los Angeles RadNet centers, who joined NUHW last year. RadNet has tried to stall contract bargaining in Los Angeles, and it made a full-court press to keep its Orange County employees from joining us. The company hired union busters, held captive-audience meetings with employees and had managers wear “Vote No” lanyards at work. But workers, who are underpaid and often so over-scheduled they have to work through their scheduled breaks, were undeterred.